So in my last post, I mentioned that I would tell you how to make preserved lemons. I wouldn’t have made these except for the fact that 1) I really wanted to make that Moroccan butternut squash and chickpea stew and 2) I couldn’t find preserved lemons. After a few weeks, I said to myself, “To hell with it! I’ll make my OWN preserved lemons!” I went to the store in search of organic Meyer lemons and found zippo… for two weeks straight. In early November, after I had dragged Jeremy to Tartine Bakery in San Francisco, we passed the Bi-Rite Market just down the street. I popped in to look for organic Meyer lemons. I found them. I bought them. All of them. Why organic? I try to buy organic in general, but I’m insistent when it comes to something like citrus if you plan to eat the peel. And the peel is the the big deal in preserved lemons. 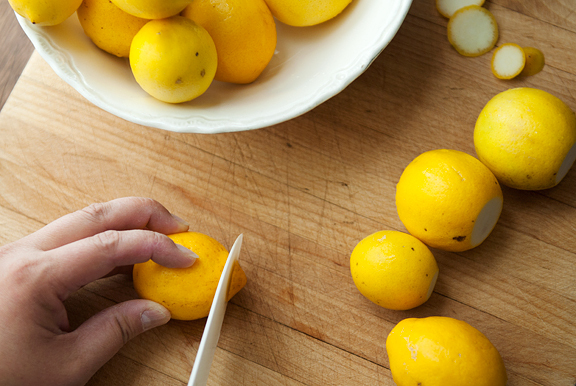 You don’t have to use Meyer lemons. Regular lemons work fine too, but Meyers are so fragrant and sweet. They are a cross between a lemon and a mandarin orange. That’s awesome crossed with awesomer as far as I’m concerned. Oh, and Meyers are super juicy. Some folks cut the lemons into quarters, others quarter them but keep the lemon connected at the base, and I’ve also seen whole preserved lemons in stores. Cutting them into quarters makes it much easier to pack them into a jar, but keeping them intact at the base or whole is prettier in my opinion. It’s that geometry issue with elliptical spheroids in a finite volume. 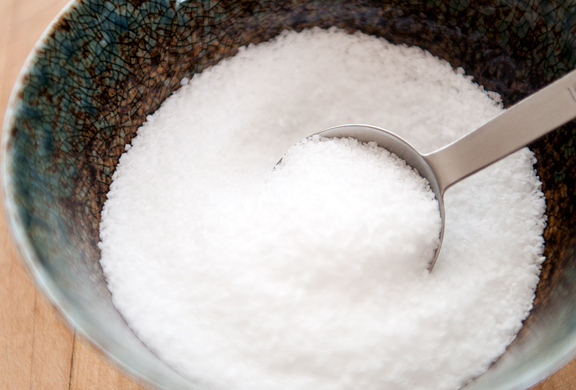 Make sure you have a good deal of kosher salt on hand. In case you were wondering if you had any cuts or scrapes on your hand, this is a GREAT way to find out… lemon juice, salt. Disposable gloves can help prevent screams of pain when you preserve the lemons. 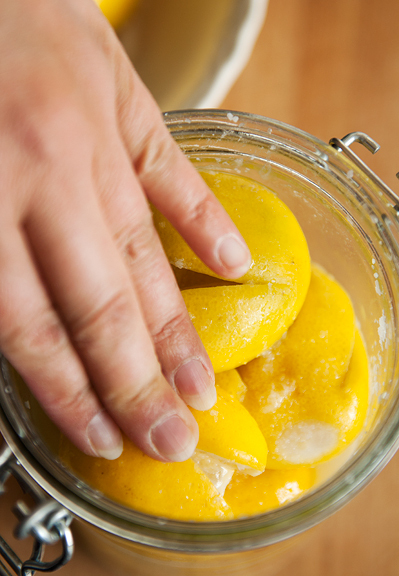 Once the lemons are ready, put some salt in the bottom of your sterilized jar and start packing the lemons in (alternating with more salt). You’re going to have to manhandle the lemons and squish them around. Juice will squeeze out – that’s okay. I tore a few accidentally, but most of them survived the process. If your lemons don’t squeeze out enough juice to top the jar, then juice a couple of extra lemons (you have extras, right?) and add liquid until they cover the lemons. Sprinkle salt on top and seal that jar. I had extra lemons still because I had doubled the recipe, so I popped them into a spare Weck jar I had on hand. It’s so darn cute. 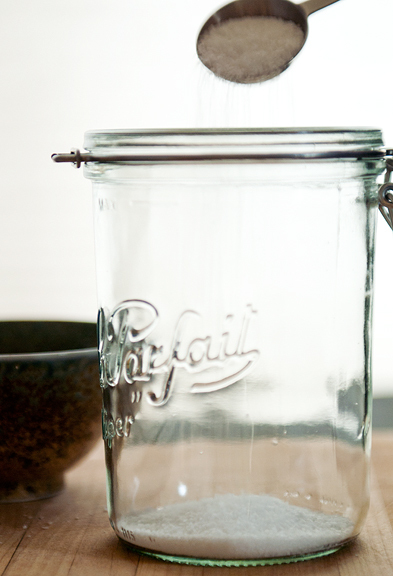 Let the jar sit in a warm room for about three days, occasionally turning it upside down. After three days, move it to the refrigerator for three weeks – still turning it over every other day or so. After the first week of refrigeration, I found some preserved lemons at Peppercorn in downtown Boulder. Of course I would! Paying an arm and a leg for that jar only makes my stash of organic homemade preserved lemons EVEN MORE precious. Not to mention, mine taste better than the expensive store-bought jar of lemons. Put a couple of tablespoons of salt in the bottom of the jar. Trim any stems off the lemons and cut 1/4 inch from the tip of each lemon. 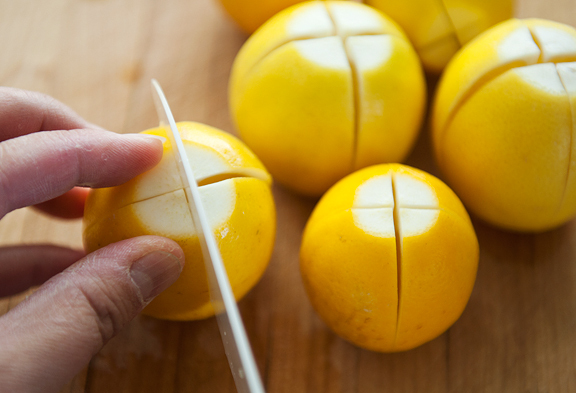 You can either quarter the lemons lengthwise or cut them into quarters without cutting through the end – leaving the four quarters intact at the base. 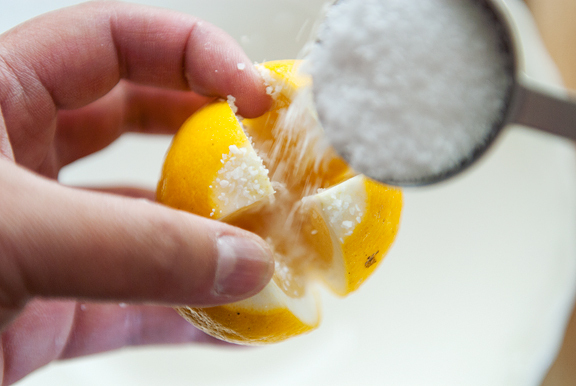 Gently open the lemons like a flower and sprinkle a generous amount of salt on the inside of each lemon and then sprinkle more on the outsides. 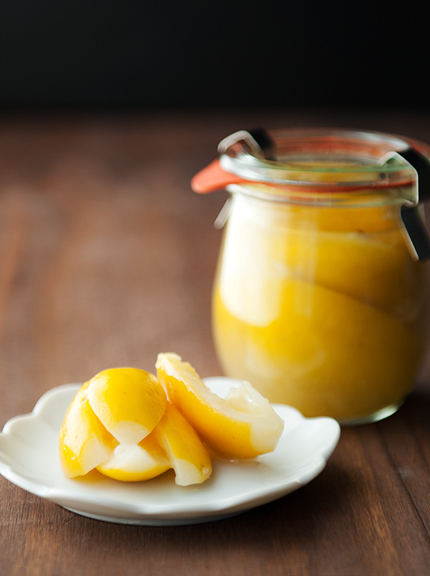 Pack the lemons into the jar, pressing down so that the juice spills out and fills the jar. Keep adding lemons until the jar is full. 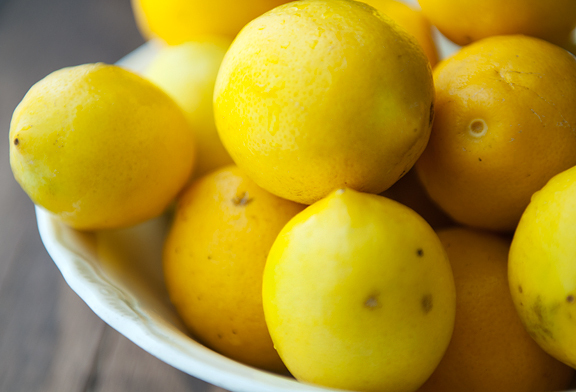 The lemons should be covered with juice, but if they aren’t, you can add some of that extra lemon juice to top it off. 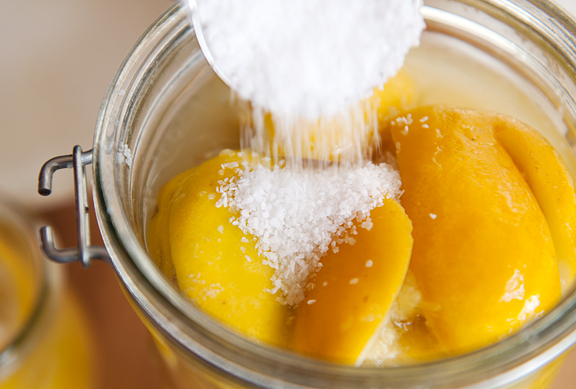 Sprinkle a final couple of tablespoons of salt over the lemons before sealing the jar shut. Let it sit at room temperature for three days, periodically (like once or twice a day) flipping the jar upside down. Move the jar to the refrigerator for three weeks, still flipping the jar upside down ever couple of days. It will be ready when the rinds are soft. When you are ready to use a lemon, rinse off the salt with water and pick out any seeds. Some folks like the scrape out the pulp, but I leave it in. Store for up to 6 months. Second, since you are mentioning sugar syrup, you might want to try ginger syrup — peel and slice up a good chunk or two of fresh ginger and simmer it with 2 cups sugar and 1 cup water. 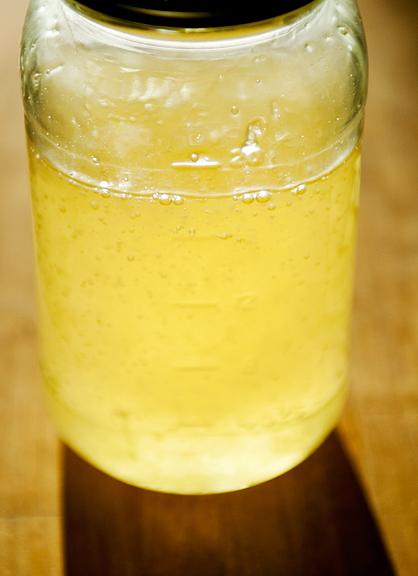 Makes amazing syrup for pancakes, vanilla ice cream, or your favorite fizzy drink. And the ginger chunks are a spicy surprise to eat separate or keep in the syrup. Your blog continues to be the best! I think you’re right about not cutting them so deeply. And, I think I’m going to try Twila’s Ginger Syrup suggestion above. That sounds heavenly too. Adore the ginger, for sure! Ooooooohhhhh….I’m going to make the preserved lemons this weekend, but I’m going to try and buy some at Wegman’s (a 45 drive! )so that I can make the Butternut Squash & Chickpea stew from your last post for our family gathering next weekend. Then I can give gifts of preserved lemons and the recipe!! So excited!! I might try Nan’s suggestion of a cinnamon stick since I just bought some Vietnamese cinnamon sticks. yummmm. These are beautiful. Lovely idea! Or preserved lemons *with* ginger? Yes please. But that might just be me. I’ve never made preserved lemons your way before but I agree, home made ones are so much better than store bought. I use this very quick recipe which was given to me by Tom Kime, a British chef who loves fusion food and now runs his own restaurant in Sydney. Put the required amount of whole organic unwaxed lemons in a pot, add water and lots of salt, cover the lemons with a plate (weigh down with a tin or similar) to keep the lemons submerged in the salt solution. Bring to a boil, then simmer for around 30 minutes until the lemons are soft and squishy. Remove from the pot, let cool, the cut into quartes and scrape out all the flesh and white pith. The thin salty, tangy yellow skin is then ready to be used. 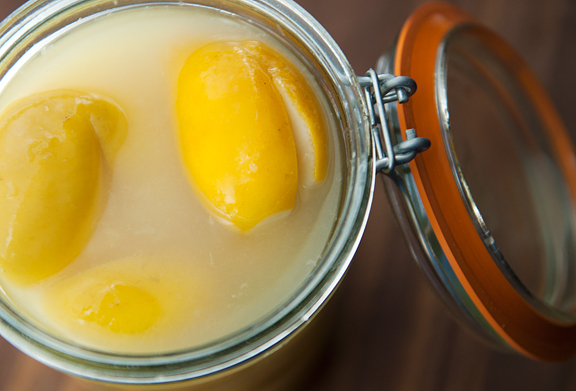 The preserved lemons can be kept in the brine in the fridge for a while until they are needed. Sunshine in a jar….I’ve got to try these! The lemony, salty, juice in the jar alone is addictive. I’ve just made a big batch of these – they are fantastic in salads. I just made some too! Giving them away as gifts this year. After just returning from Morocco I can’t believe I’ve lived so much of my life without these gems. Such an incredible flavor. My parents sent me a 3rd batch of Meyer Lemons from Palm Beach so I made the preserved lemons last week. I’m limited on fridge (and jar) space so I quartered mine. I whirl them up in my food processor for salad dressing. Might use them in my chicken tonight – we’ll see . Oh and the other 2 batches of meyer lemons – I make the best lemon curd for my Greek yogurt breakfast! Beautiful, beautiful picture. Love the yellow color. I keep coming across recipes that call for preserved lemons, but haven’t been able to find any in the shops. It looks like this recipe may well solve that problem! I can’t wait to try it out! “elliptical spheroids in a finite volume” — that made my day! I had used a slightly different method for preserving lemons before, but I think I like yours better. Will try it next time :-). Thanks for sharing! 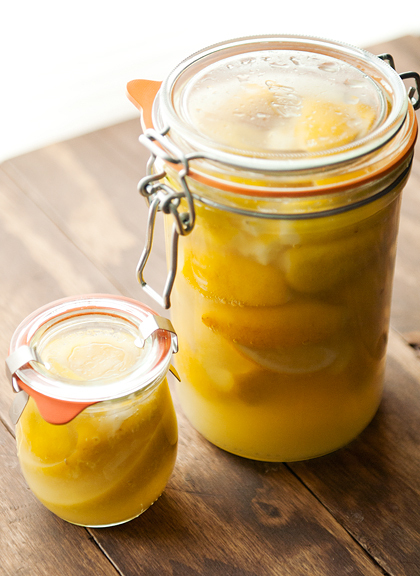 I have run across several recipes that called for preserved lemons and live in an area where they are not available. I am looking foward to trying your recipe. Throwing a cinnamon stick or ginger in it also sounds amazing. My taste buds are having a party just thinking about it. Thanks for sharing. Nan – That’s what I want to do next if I could get my grubby little hands on more organic meyers! Linda – Sounds great (and Wegman’s was my goto grocery store for any special or fancy ingredients). Andrea – Oh, that’s interesting and fast – although I quite love using the entire lemon. I’d love to learn to preserve them whole. Margie – shouldn’t be too hard to procure those lemons where you are, right? Sally – I also love them in salads! Jane – Never thought to purée them for dressing, but it totally makes sense. Add a Little Love – thanks! Mel – yeah, it may be hard to find in some locations. But to be honest, these taste soooo much better than store bought preserved lemons anyway. Tony – that is SO awesome! Thanks for the little cultural lesson, Tony. I love that! Cathy – they’re lovely. Really lovely. Dianna – yay! I hope it works for ya! You can also make a terrific little lemonade with preserved lemons, which from memory is a very Vietnamese drink. I don’t know anyone else who would drink it but I’ve drank preserved lemon lemonade since I was a kid. When i force people to drink it, much like avocado sinh to, they always remark that it tastes like cumquats though? The basic recipe goes something like, mash/blend the preserved lemon in enough sugar to cover the preserved lemon, once happy with the texture of mush, dissolve with a small amount of hot water, add lime/lemon juice to taste and top with cold water and ice. The preserved lemon adds a fantastic tang to the lemonade. Romy – thanks for the tip. I will have to try that some day. Can you tell me if anyone has ever made presrved limes? Can you do the same thing as the preserved lemons? Thanks. Donna – I don’t know, I’ve never tried it nor seen it. Sounds good though, doesn’t it? I used to make these about 20 years ago. I kept some of the jars for 3 – 4 years and eventually the lemons turned an amber colour and the juice set into a beautiful clear amber-coloured jelly. I only ever kept them in a cupboard in the dark; I didn’t refrigerate and they only tasted better and better with the passing of time. So my tips are to never throw them out, never refrigerate and enjoy.